I really thought that my Hippeastrum 'Benfica' flower, the subject of this post, would be open by now. It, however, has other plans. I am consoled by the appearance of a second flower bud, seen peeking out from behind the taller stalk. I will post pictures when the flower finally opens. In other news, I am sad to report that while several of my coleus (Solenostemon scutellarioides) plants are doing fairly well under my light set-up, (see posts here and here) popular favorite 'Tilt-a-Whirl' is no longer. The plant lost quite a few leaves, then just sort of rotted out. 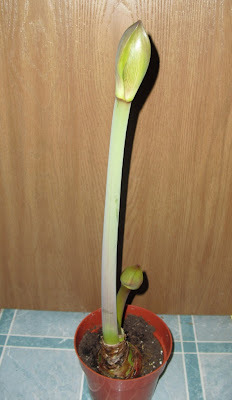 I'm still waiting for my Hippeastrum>/i> bud to open as well. And I've lost all but one of my coleuses. And let's not even talk about the >i>Abutilon cuttings, or I'll cry.